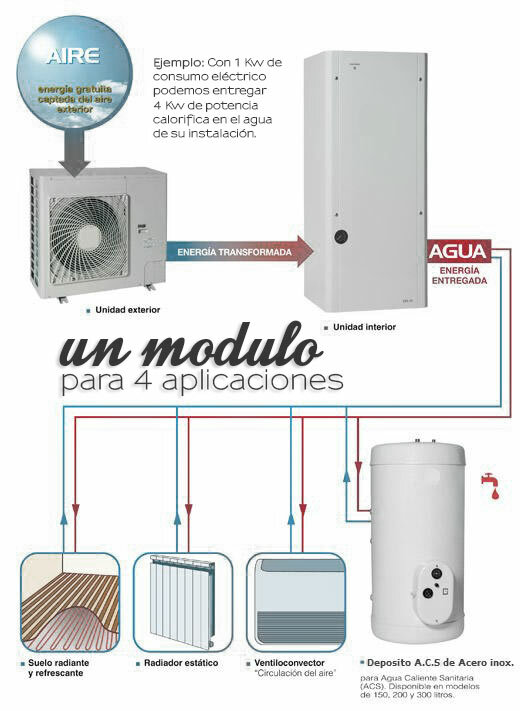 Aerothermics - Servicio Técnico Oficial Daikin Málaga. Acontermica. It consumes approximately 80% less electricity than an electric heater for the same amount of heat, resulting in huge savings. The installation cost is very low. It is much more efficient than traditional furnaces. Maintenance is almost nonexistent, resulting in high dividends and huge savings. The Aerothermic system is perfect to use with heated flooring. It´s an all-in-one integrated system. Operating costs are low because the compressor is the part which uses the most energy. It can be installed in both new construction and remodels. The Daikin Altherma Aerothemic system is ideal for integrated HVAC (heating, ventilation and air conditioning). It produces fresh air in summer, heating in the winter and hot water throughout the year. Aerothermics also lowers energy consumption, so it is a good alternative to gas boilers and installation is not complicated, in fact it is rather simple, and it can even be connected to home radiators. 1.-The heat pump extracts the heat from the outside air. 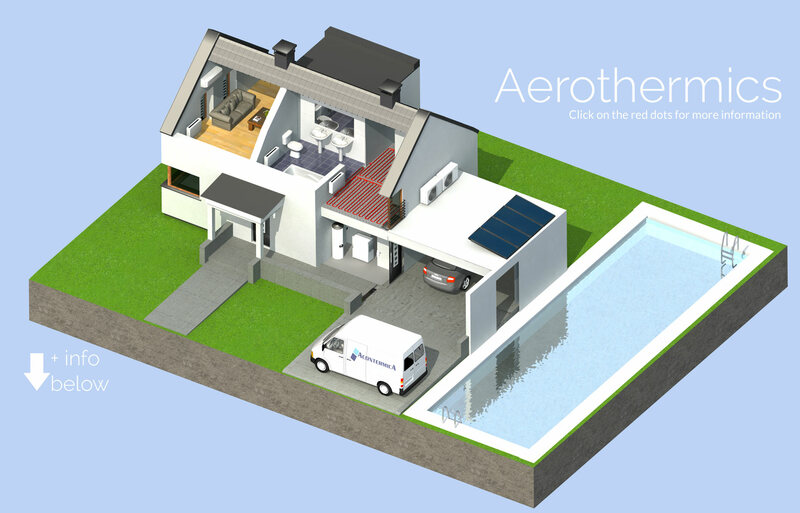 With thermal energy from the air, Aerothermics heats the water in the storage tank with the heat exchange which is connected to the heat pump. However if we already have a thermal solar system, we can also use this system by connecting our panel as an accessory to the Aerothermic system with a kit, allowing hot water production. 2.-The Aerothermic system raises the temperature of the heat recovered. Even though the outdoor unit captures energy from the system, it is the internal unit that administers the thermal processes so that the installation can provide heating, cooling and domestic hot water (DHW). The efficiency used to produce heat is 5 times faster than a traditional system and the energy consumption is much lower thanks to the system inverter. In order to gain the maximum potential of the Aerothermics, it can also be combined with heated flooring providing numerous benefits such as the absence of sizable equipment in rooms, no running noises, no drafts, no dirty walls and you get the most out of thermal use with the large surface area installed in the flooring of different rooms. Another feature available is pool heating. Acontermica has an official Daikin Certificated Technical Service as well as an Alterma Level 1 accredited course certificate. Acontermica has completed Daikin Alterma installations in Malaga and Marbella, in homes, businesses and hotels. Acontermica has made Daikin Altherma facilities in Malaga and Marbella, for homes, businesses and hotels. El Corte Ingles, Hipercor, St. Lucia Seguros, Pernaud Ricard, Mail, Aena, Cepsa, Hotel Larios, Vincci Hotels, Hotel Central Marbella, are some of the companies that have relied on Acontermica for the design and installation of the air conditioning systems and industrial ventilation.